The winter holidays are almost over. Now, what do you do with all those pictures you have taken? I don't know how many pictures I have taken that are just stored on a disc, or on a computer, not to mention all the older pictures stored in bins. I have a solution for you, Kodak Alaris Photo Kiosks allow you to print off your photos in various sizes so you can share them with friends and family. You can also order gifts! You can choose to make a photo book, put your photo on a coffee mug, button, create calendars or cards, there are so many options. You can create a lasting memory with your holiday photos. The KODAK Picture Kiosk lets you make prints and enlargements in just seconds. You can make prints from your digital camera card or from other prints. You can even make prints from your camera phone. Once you upload or scan your pictures into the KODAK Picture Kiosk, you can improve your pictures with quick and easy edits like zoom and crop. Reduce red eye in just seconds. Restore color to old photos. Turn a color photo to a black and white or even sepia print. The kiosk was so easy to use. I took my iPad to the local Hyvee and was able to connect through Wifi to upload my pictures. You can also connect with Bluetooth or use an SD card. The program walks you right through your choices. Each step allows you to back up or start over if you have made a mistake. For photos you receive them right there within minutes. The photo books, mugs, etc,. take longer, but you design them and order them right there. These is an app for your mobile phone or IOS device that allows you to connect to the kiosk. Once downloaded you are ready to go. You can find the App HERE. So, with the Kodak kiosk you can easily re-size photos, remove wrinkles or red eye, crop, zoom, or use one of their other options for touching up your photos. You will be able to restore old photos and adjust brightness or colors. Kodak is going to send one of my neighbors a $25 GC so they too can experience what the Kodak Alaris can do. So start looking through your pictures and download the App. Thanks for stopping by today, At the Fence! See you next year! Disclosure:I received no monetary compensation for this post. I did receive a GC for review purposes. All quotes in red are taken from the sponsor's website or email. All thoughts and opinions are my own. Personal Planners for the New Year! I don't know about you, but I am really quite disorganized at times. If I don't jot down a small note to remind myself of things I need to do, I would really forget quite a few things. My daughter laughed one day because I had 10-15 sticky notes stuck around the edges of my computer to remind me of activities I needed to accomplish that day. Anyway, I was given the opportunity to review a Personal Planner from Personal-Planner.com. You actually get to design the way you want your planner to look and what you want on the pages. I received a code and proceeded to the Personal Planner webpage. You literally get to design your planner. You can choose themes from their site. I personalized the front of my planner with my name and the year. You can choose a picture from your own files for the front if you like. Inside on the first page I added a Bible verse and my contact information, just in case I misplace my planner. Next choose when you would like your planner to start. Mine of course started with the first week of January. Remember, I will be trying to be much more organized this year. You can decide if you want lines to write on or just blank space. At the bottom of your weekly calendar, you can add your workouts. This makes it easy to keep track of your exercise. You can also add the weather, where it will allow you to check off what type of weather you experienced each day. I also added a To Do list at the bottom of the page, where I can check off after I have completed each task. At the end of my planner I added an overview of 2014. I also added plenty of lined pages at the back for taking notes, writing memos, etc. I added birth dates and anniversaries, including names and ages. The planner has nice, heavy see through plastic covers. I was able to include a plastic insert that I can move around in the planner. This can be used to hold birthday cards, receipts, whatever you might need with your planner. It also came with a small ruler that easily attaches anywhere in the planner. A matching plastic band is used for holding the planner shut when it is not in use. There are many more options for your planner. You can add pupils, exams, to do lists, graphs and more. These would show up at the bottom of each page. The medium size planner is $29.95. This includes shipping. All of their prices include tax and shipping. Also available are wall planners and notebooks, along with accessories, like pens, rulers and extra plastic sleeves. I am definitely pleased with my Personal Planner. I am really hoping this will help me organize my days and my blogging. 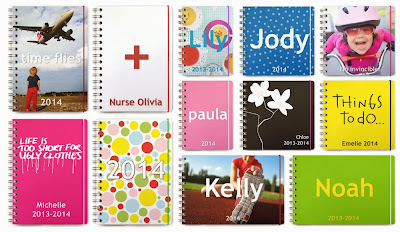 Look at some of the beautiful planners you can create at Personal Planner. What do you think? 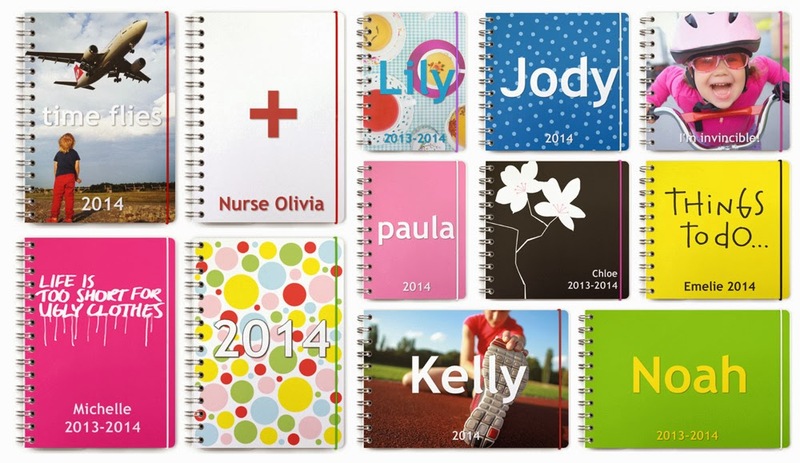 I think creating and purchasing one of these planners could be a GREAT way to start off the new year. They would also make wonderful gifts! Since you can start them on whatever week/month you like, they would also make nice gifts throughout the year. One neighbor will receive a code to design their own Personal Planner. The winner will be able to start their year off more organized also! Be sure to check out the Personal Planner website! Thanks for stopping by neighbors! See you soon At the Fence! I have a new giveaway, sponsored by my husband. We are going to do a giveaway for a $10 Gift Card to one of three places. The winner will get to choose a $10 Gift Card to either McDonalds, Sonic or Wendy's! Is that exciting? I am going to run it the entire month of January. We will start out with the mandatory entry and of course the regular entries, but then I will add extra entries throughout the month. Some will be for one entry, others will be for more. So, the mandatory entry will be to tell me in a comment one thing you are going to try to change or improve this year. Remember this will run the entire month of January so start entering now! Thanks for stopping by, At the Fence! I have notified all winners of giveaways that have ended. Not all winners have responded yet. I am allowing a little extra time due to the holidays and everyone's busy schedule. If they do not respond I will be choosing other winners. To all winners who have already responded, your information has been forwarded to the sponsors. Please remember that winning emails will be sent from blessed6mom at yahoo.com or atthefence at gmail.com. The subject line will read, "You won At the Fence!" 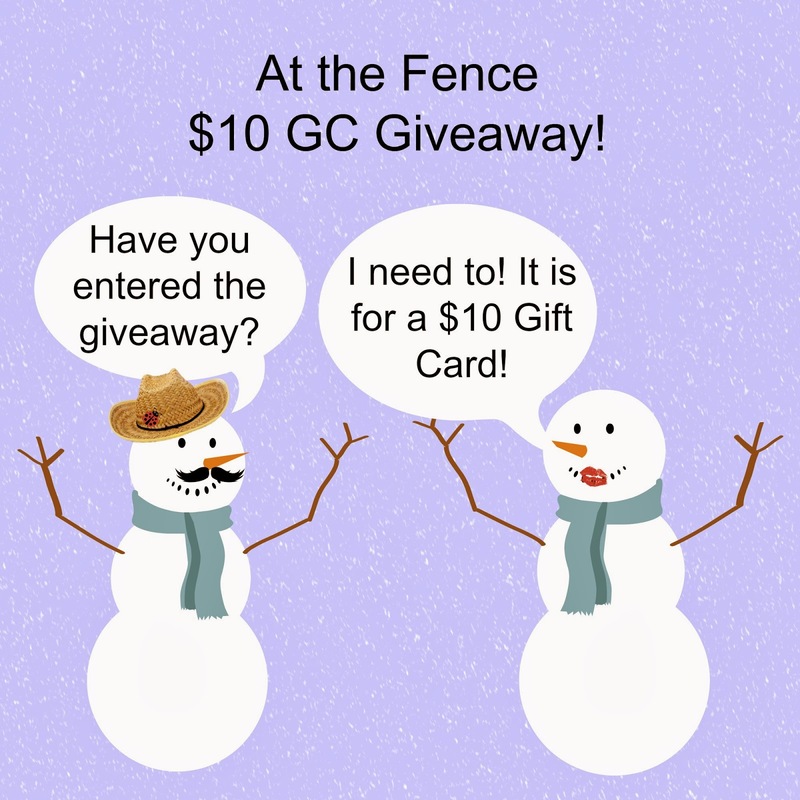 I have some nice giveaways coming up in the next week or two, so please be sure to stop by At the Fence for a visit to find out what is going on here. Some new changes to At the Fence this coming year. I will be rating products reviewed with a new ranking system. I will use a sign that will have anywhere from 1-5 symbols to rate the product. The symbols may change with the seasons. I will also be adding a photo day where we will share some of the photos we have taken that week. I have not decided on what day or what we will call it, but I will appreciate your comments. Giveaways will continue to be hosted on Rafflecopter. Please spread your daily Tweets out some. I still have some people tweeting all three right in a row. The whole idea is to spread them out and share them with others. I have recently started adding entries for sharing on your Facebook page and will continue to do so. Giveaways are now listed in the sidebar. Apparently the giveaway page was not working well, and it is more difficult for me to keep updated as a page. I will be starting up the Surprise Boxes again. I took a break over the holidays as we were quite busy just keeping up with the product reviews and giveaways. I would like some ideas on themes for the Surprise Boxes so please leave a comment. Last request. If you have any ideas to improve At the Fence please leave a comment. Maybe you have an idea for the design or how At the Fence giveaways are run. Or perhaps you have some review or giveaway suggestions. Please share them. One last bit of news. I extended the Terracycle giveaway as it had no entries. Imagine my surprise when I checked and the Rafflecopter was not showing up. Please, please, please, if you notice something like this, shoot me an email and I will correct the problem. Thank you for stopping by At the Fence! I have to tell you I was skeptical regarding this next product. It is called The Wet Brush ($14)! 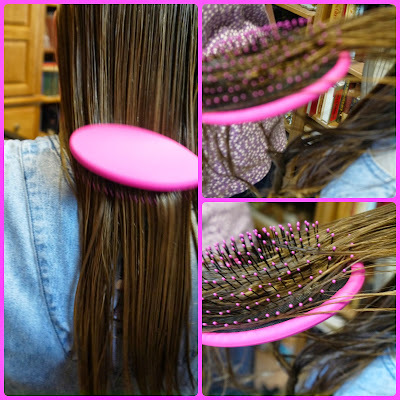 The whole idea is that it does not pull your hair, like a regular brush does. Now, with 4 daughters, and of course myself, all having long hair, we end up with quite a few knots that need removed. Sometimes it is from a day of play, or sleeping, but recently we had one back into a fly strip. We ended up with a sticky knot! I sent her in to immediately shampoo her hair and then I brushed out her hair for her. We used The Wet Brush. It worked! I had already noticed that The Wet Brush did not pull like our other brushes and combs, but this really impressed me. Now, after each one showers I notice that my brush goes missing. It also disappears first thing in the morning and I have to hunt it down. I am beginning to think we may have to purchase a couple more. Or maybe I should have them each purchase their own and hide mine! The same daughter who backed into the fly strip is the one who squirms the most when I brush her hair. I hear "ow" several times during brushing her hair. Not anymore. She even mentioned that the "new" brush works better. Yay! • Super soft IntelliFlex™ bristles. • Detangle hair with ease. • Works great on wet or dry hair. • Perfect for men, women & kids. • For thick, curly or straight hair. • Great for hair extensions & wigs. Very seldom am I completely surprised by a product, but The Wet Brush managed this. I will be replacing mine if it is ever lost or damaged. I am also considering purchasing the brush they have for dogs. With three Shelties I am thinking it might be a GREAT idea. They have so many sizes, shapes and colors to choose from. 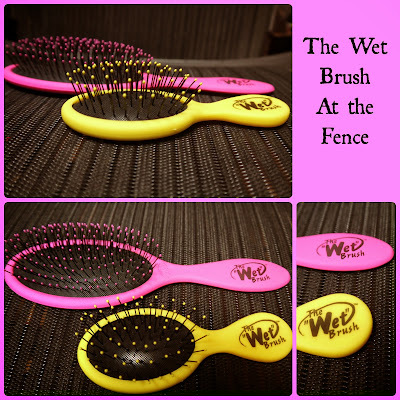 The Wet Comb is another item I would like to try! When my Wet Brush arrived I also received one of their Lil' Wet Brushes in yellow ($10). I would like to give this one to one of my neighbors! So, let's get the giveaway started! Thanks for stopping by At the Fence! I'll see you soon! Our Shelties LOVE the Snow! Check out the Shelties playing in the snow. We had our first good snow. It left a few inches on the ground and the dogs loved it! They chased each other around and kept biting at the snow. It was so funny! Glory, our Tri Sheltie and Grace one of our sable and white Shelties, decided that snow was fun! Jubilee and Pansy stayed inside for this play session! Glory has decided it definitely is not spring as advertised above! Grace likes sticking her nose in the snow! A wild romp across the yard quickly ensued! They really had quite a bit of fun! I am sure I will be sharing more pictures as winter progresses! Enjoy! And see you soon, At the Fence! Have we got a toy for you here, At the Fence! In fact the box reads ages seven and up, but with this nifty Road Rippers remote control vehicle, buyers could go all the way up to Dad's age! Everyone knows that when dad buys a remote control vehicle for his son, he is just waiting for a chance to play kid again! And this RC is high class with an easy-to-hold controller, not like some that are too bulky or too small to be utilized comfortably. This design by Road Rippers is full function and you might ask, "What does that mean?" How about a Mobile Command Unit with full motion, yes, that's right, it turns in all directions and races, yes, I said races, forward and in reverse! Nonstop action! 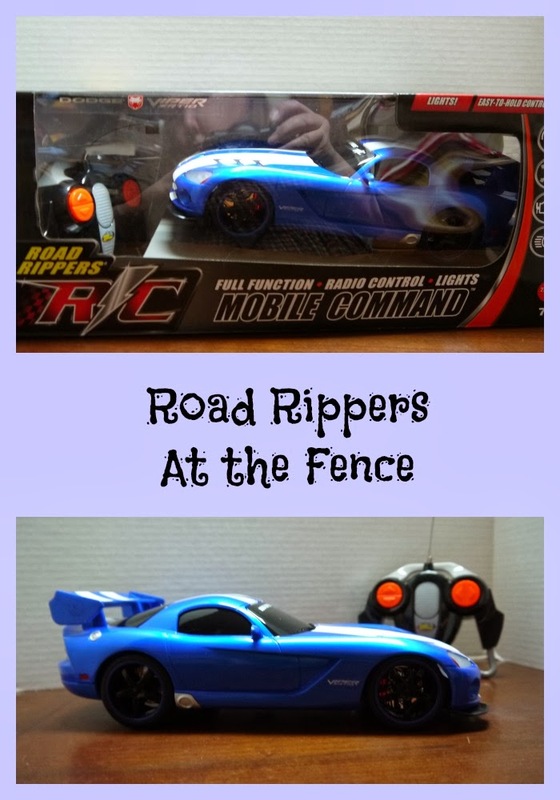 Very durable the Road Ripper remote control is of course, completely wireless, no wires to get tangled when you are the driver of this sleek sports car! 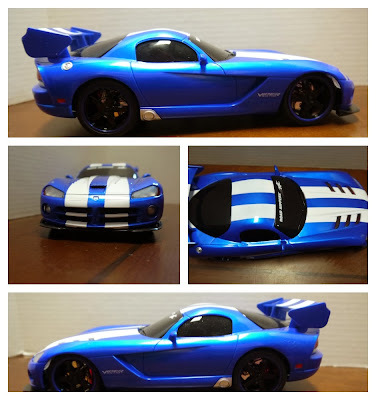 Mine is the Dodge Viper, one of the nicest cars out there with that sporty look, so that was a perfect choice by the makers of RR Remote Control vehicles. Make your own personalized course or just have fun dodging through the living room furniture, you make the track with the Mobile Command RC cars! Even try outside for some extra fun, a driveway or for a great time, gather up some friends and head to the city park. If dad persists you can even let him come along (especially since he might be the one driving your group to the park) and get involved in the fun. Outings like this are doubly enjoyable when there are two Road Rippers that can compete against each other! And when it seems like there is no other way to enjoy your new toy, try it outside or with the lights out in the house, as the Road Rippers all come with working headlights! It doesn't get much better than a Road Ripper RC car! Road Rippers, handle great. We had them speeding around our dining room. It is much too cold and snowy to take them outside. Our dog, Grace, wasn't sure exactly what was racing around the floor. She would try to get close, but if it went in her direction she took off running, only to return seconds later. They really are nice cars. I am looking forward to sharing them with some little boys who are coming to visit us soon, if I can keep it away from the adults! Road Rippers are available in three different styles: the Dodge Viper, Dodge Challenger and the Ford Mustang. All three look pretty nice! They require 4 AA and 3 AAA batteries. Thanks for stopping by At the Fence! Looking forward to seeing you soon! Disclosure:I received no monetary compensation for this post. I did receive product for review purposes. All quotes in red are taken from the sponsor's website. All thoughts and opinions are my own. 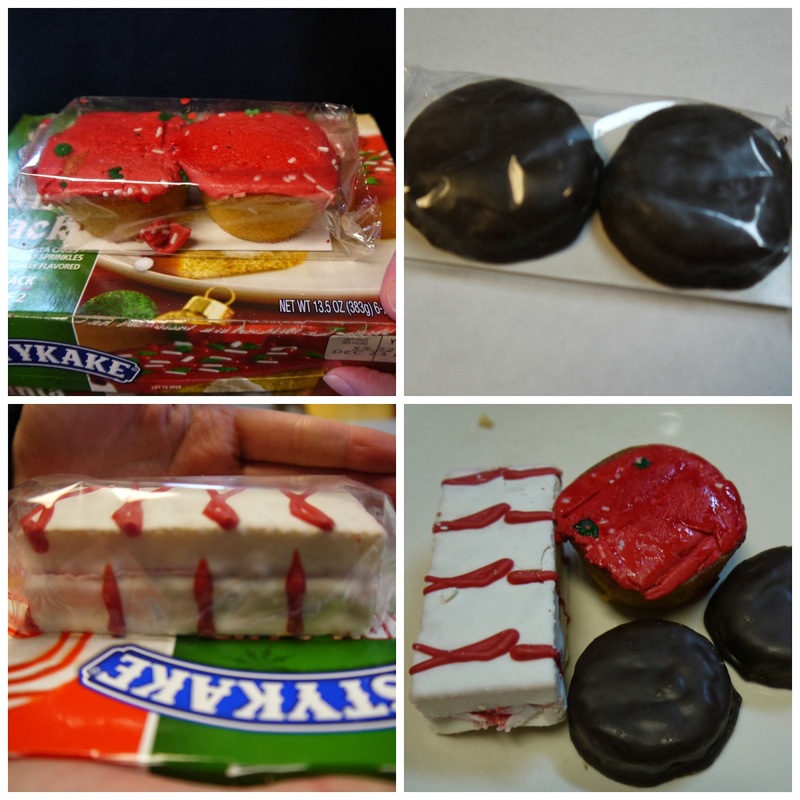 TastyKake Treats! Great for Holiday Snacking! 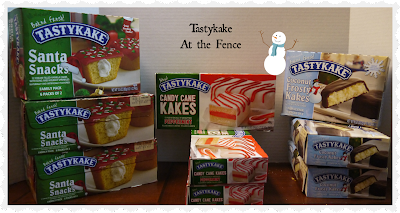 As everyone is gearing up for holidays, family gatherings and friends dropping in, I want to share some Tastykake products with you! We received a sampling of the Tastykake Holiday products! They were literally disappearing before my eyes as I unpacked the box. My oldest daughter (28) said she really likes Tastykakes and wishes they were sold around here. As we travel quite a bit she has had some of the Tastykake products, but no one here carries them. My 16 year old immediately grabbed and his some of the Coconut treats. She really likes coconut, so she took a box to hide for herself. They are the Coconut Frosty Kakes, a dark chocolate covered coconut kake. My husband liked these too! 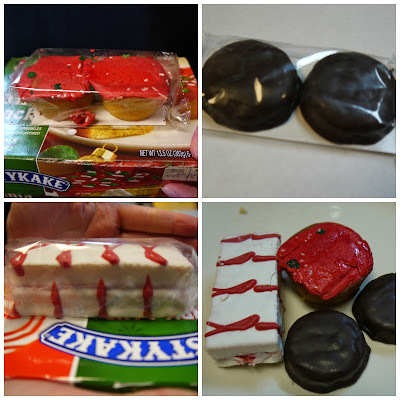 The Candy Cane Kakes were a family favorite! I think everyone liked these. A layered white cake with red peppermint creme' and a white peppermint flavored coating with a decorative red drizzle. They are very eye-catching too! The last snack we received was a tasty creme-filled vanilla cake with holiday icing and festive sprinkles. They are called Santa Kakes, but are basically decorated cupcakes. These were also well liked. My problem was limiting how many Tastykakes each person could have. 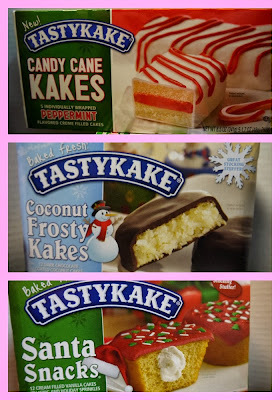 My daughters (all 4) went away for a girl's night trip and grabbed plenty of Tastykakes to take on their trip. They used them as a snack traveling and of course in the hotel room. We have the Tastykakes in a glass bowl on our dining room table for easy access. These would make a perfect snack for a holiday party! Be sure to keep a variety on hand for those unexpected guests. Be sure you visit their website, preferably when you aren't hungry! LOL! Then hop over and follow them on their social media pages. Have a great holiday! See you soon At the Fence! 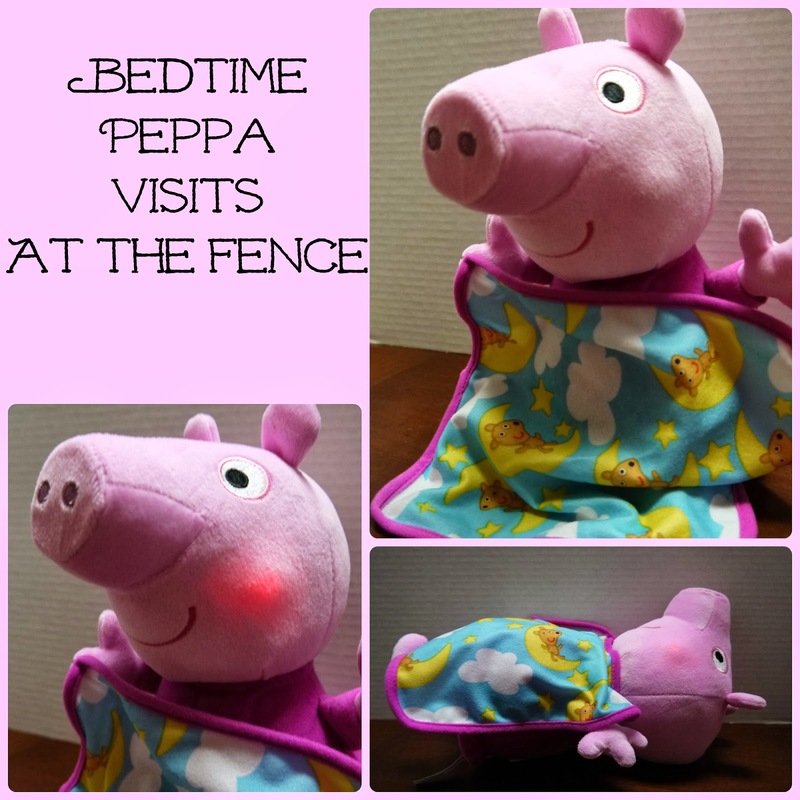 Bedtime Peppa At the Fence! 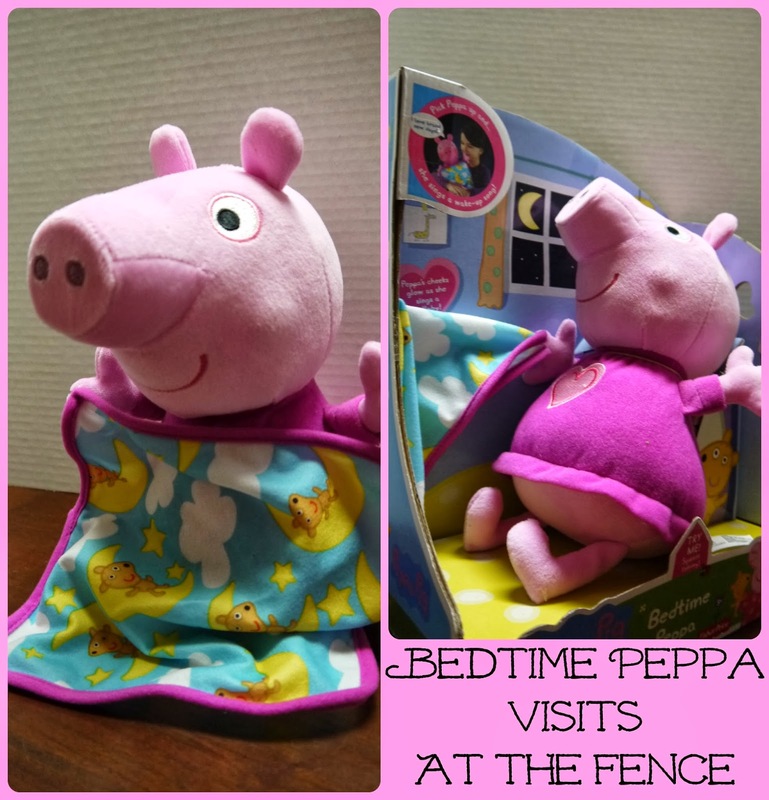 Check out Bedtime Peppa! She will join your child at bedtime. She has a small blanket. When you press her tummy, her cheeks glow pink and she sings a bedtime song. She also sings a brand new day song. Your child can count sheep with Peppa too! I love Peppa's accent. She sounds just like a little girl we used to know. Her name was Riley, which she pronounced Wiley! 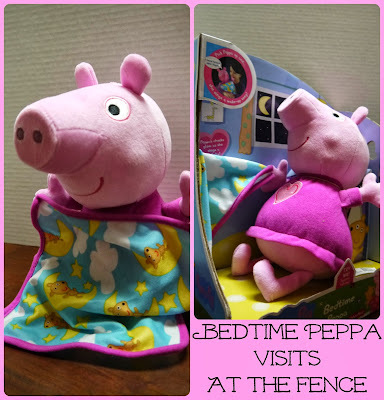 Peppa will help your child enjoy bedtime! Love the giggles and oinks! 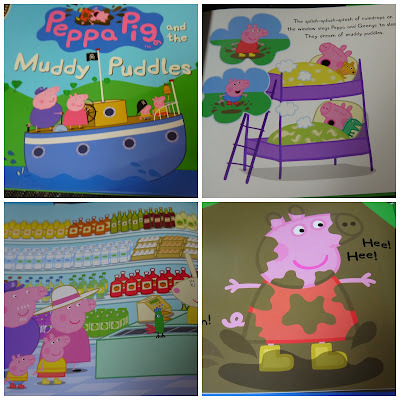 Along with the Bedtime Peppa, we also received the Peppa Pig and the Muddy Puddles. 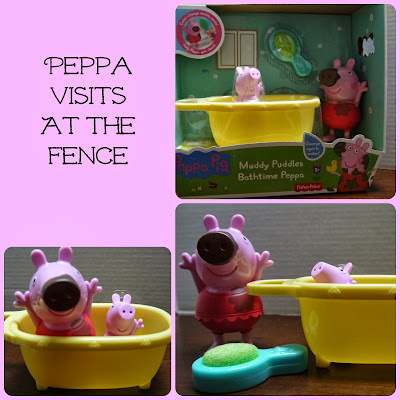 Perfect for reading after bathtime with the Muddy Puddles Bathtime Peppa set, and right before going to bed with Bedtime Peppa. A cute little story about Peppa Pig who wants to play in the muddy puddles after the rain. At the end of the book she, and her friend George, get to do just that! I think your child would really enjoy Peppa. Bedtime Peppa is designed for ages 3 and up, just like the bath set. Peppa is 11 inches tall and is extremely soft. You can find her at local department stores. I found her for $34 on Amazon. Thanks for stopping by! See you soon At the Fence! Disclaimer:I received no monetary compensation for this post. I did receive product for review purposes. All quotes in red are taken from the sponsor's website or email. All thoughts and opinions are my own. This is one really cute bath time toy! 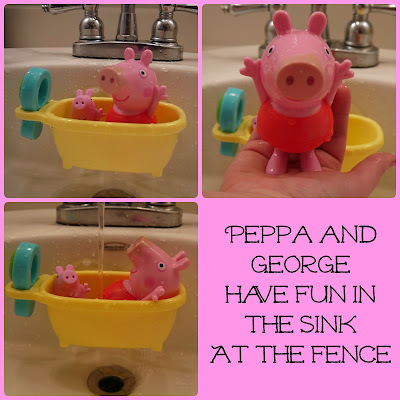 Peppa pig is adorable to begin with, but this bath set is simply fun to play with. Peppa, George, a tiny yellow tub and a brush are included in this set. Peppa is actually a little muddy, and with her brush and some warm water (actually the warm water does it) you can clean her up. And George? He squirts water! Out of his nose! My children found this extremely funny! 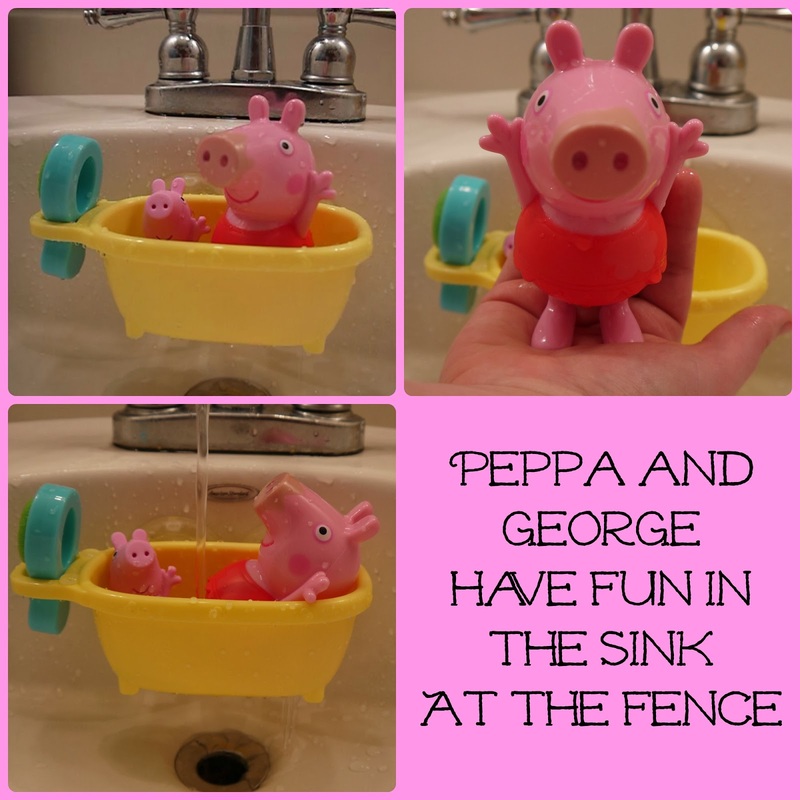 Peppa's little yellow tub has suction cups on one side, so you can attach it to the side of your tub. Please do not fill the tub anywhere else, like your dining room table as there are drain holes in the bottom. We found this out when my daughter thought she could fill the tub while it was sitting on the dining room table. At least it was easy clean up! Muddy Puddles Bathtime Peppa is from Fisher Price. It is recommended for ages 3 and up. 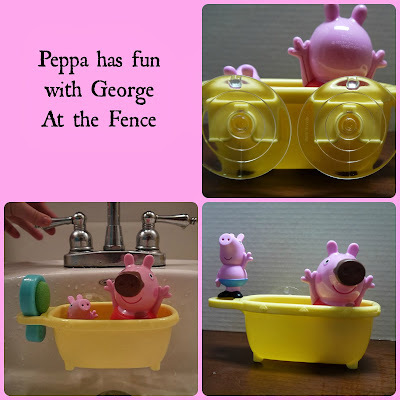 Your youngster will have fun playing with Peppa and George at bath time. Just make sure you are not close enough to be squirted by George! 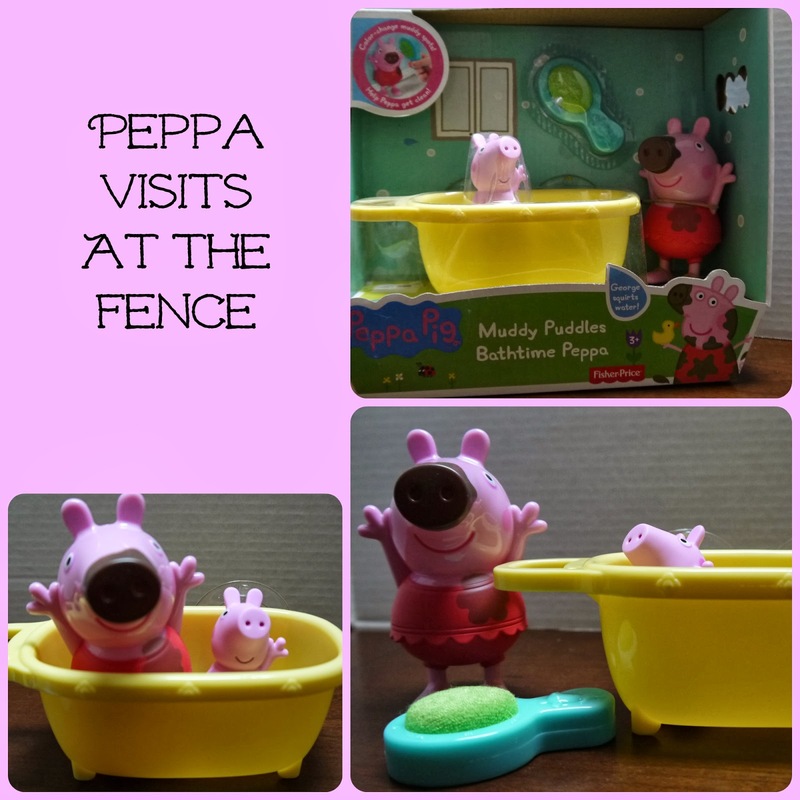 You can find Muddy Puddles Bathtime Peppa at your local department store or on Amazon. I found her at Toys R Us for $14.99. So glad to see you today, stop by again soon At the Fence! Peppa Pig is adorable! I am sure children would enjoy any of the products of Peppa. Still doing last minute shopping? How about a Professional Skin Care System (on sale for $39.95) from ToiletTree. I really like this Skin Care System. 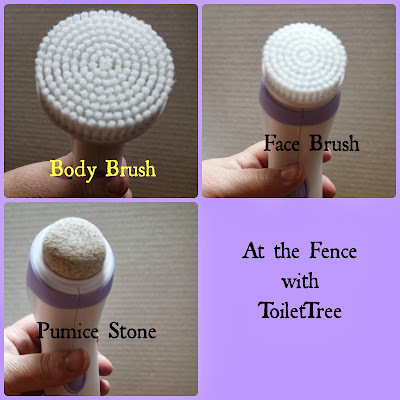 It has 1 Body Brush, 2 Face Brushes (1 soft and 1 medium), and a Pumice Stone. This handy little tool runs on 4 AA batteries. The 4 interchangeable attachments are easily changed out on the rotating head. The tool is water proof, so it is perfectly fine to take it in the tub or shower with you! Ahhh... spa time! It comes in several choices of colors too! Green, blue, purple (like mine), pink, grey or black, all with white of course. Using this tool daily will help cleanse your skin, stimulate skin renewal, remove dead skin cells, energizes skin and enhances the absorption of moisturizers. You can use the Skin Care System daily to help improve the condition of your skin. Apply your facial cleaner to your face and then use the brush to gently clean your face. The softer brush is to gently clean, while the medium brush is for exfoliation. The same applies to the body brush, apply your soap or cleanser and then use the brush to cleanse your skin. For the pumice stone you can choose to use wet or dry. Do not use on your face, but you can use it on your elbows. Immerse foot in water to soften and them lightly pat to remove some water, leaving the foot slightly damp. Then slowly, in circular motions apply the pumice to your foot or elbow. This will remove dead skin. Apply a moisturizer when you are finished. 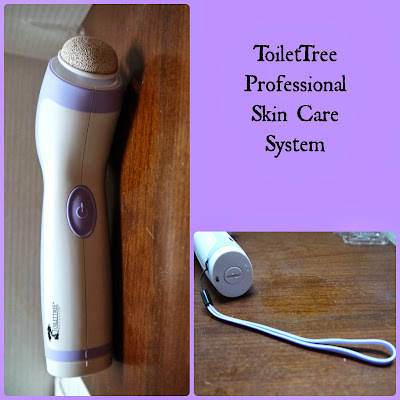 The ToiletTree Professional Skin Care System is easy to use and only takes a few minutes a day. I mean, you are going to shower or bathe, right? I personally enjoy using this. My face feels fresher and clean after use. I also really like the pumice stone on my feet. I have a tendency to run around barefoot all the time and the soles of my feet end up callused and cracked. I know, I know, I should wear shoes, but barefoot is just me. I take shoes off as soon as I can. What type of regimen do you have for skin care? Start taking care of your skin now. 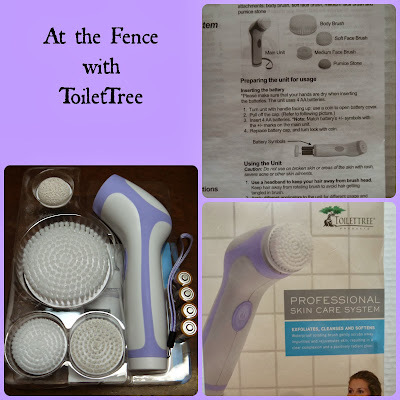 I am sure most of us would benefit from using the ToiletTree Professional Skin Care System. ToiletTree Products began with a simple holiday gift from Mom. After receiving a fogless mirror as a Christmas present in 2008, Steven, who had always loved the concept of shaving in the shower, made it his mission to redesign the mirror that failed to stand up to its claims of being fog-free and unshakable wall adherence. Fed up with frustration and uneven shaves, Steven joined forces with his father and brother to design a mirror that not only stayed attached to the wall, but, most importantly, guaranteed a fogless face for life! After many long months of brainstorming and testing prototypes, the trio took their design to manufacturing in January of 2010, where ToiletTree Products was finally born. A fun play on the word ‘toiletry,’ the company takes its name from the category in which their creations fall: bathroom products! In only a mere six months, ToiletTree’s Fogless Shower Mirror made its debut on Amazon.com, earning the title of Amazon’s #1 top-selling beauty product by Christmas of 2010. Due to the overwhelming number of customer requests, ToiletTree’s Fogless Shower Mirror expanded its line to include the Deluxe LED Mirror, as well as one fit for travel and On-The-Go. Today, ToiletTree Products rounds out its brand with the addition of other new essential bathroom products including nail clippers, face cleanser, oral irrigator and a collection of Bamboo bathroom accessories. A family-run company, ToiletTree Products takes great pride in providing consumers with unique and innovative products of only the highest quality. Thanks for stopping by At the Fence! 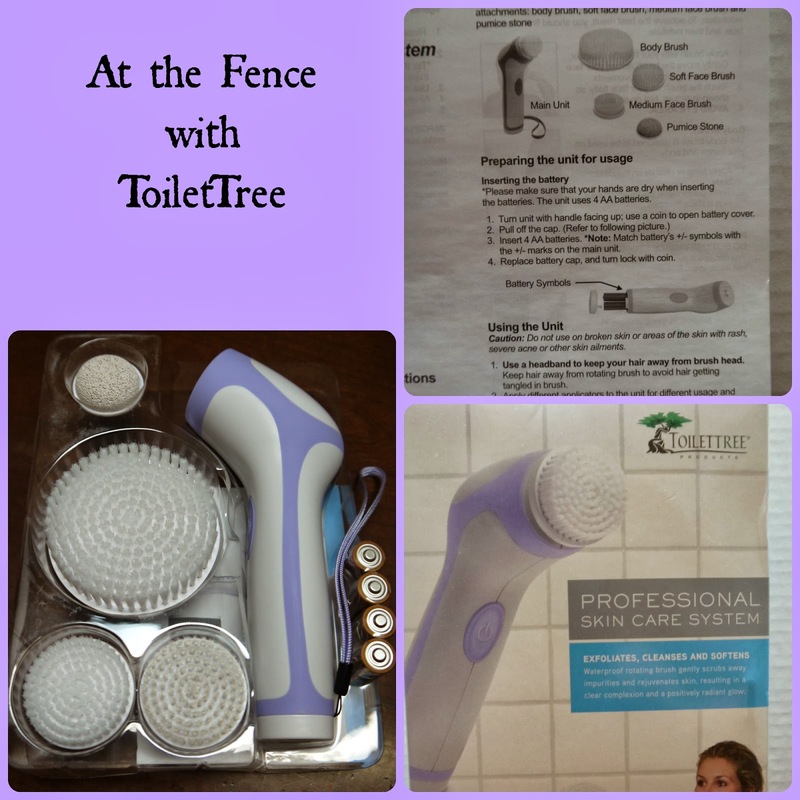 Please take time to check out ToiletTree and consider their Professional Skin Care System as a gift! Have you ever heard of Swagbucks? They're a completely free, no strings attached site that rewards you for all of the things you're already doing online. Search, Watching Videos, Playing Games, Taking Surveys, Shopping and more - as you do these activities, you'll earn Swag Bucks, which are reward points that you can redeem for all sorts of gift cards in the Rewards Store. You can download their toolbar or download their OS and Android apps for more opportunities to earn. Choose the activities you like or have time for - how much you earn is up to you! I've used Swagbucks for 3 days and so far I've earned 230 Swagbucks. You can do the same! 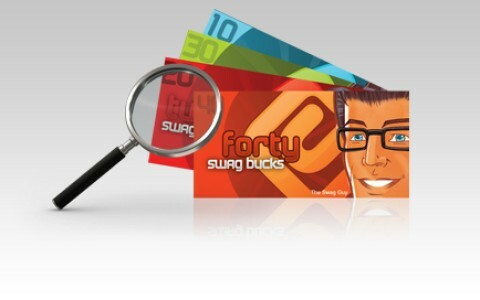 To sign up for Swagbucks, click this link http://www.swagbucks.com/refer/atthefence and join me. You can use my code Atthefence64 and earn 70 extra Swagbucks for signing up.To enter registration codes, you should click the text that reads "I have a sign up code" as you're initially signing up. Look at Our Newest Pets! At the Fence with Terracycle! Visit The Tie Bar with Us! Yellow Pages App and Prize Pack! Cash Cache from Money Savvy! NAPA $25 Gift Card Giveaway! Lovable Labels A Great Idea! More Cheese Please Exclusive Coupon Code! Medieval Times for the Holidays! Cover Your Hair Gift Ideas!